Even though a lot of open source projects encourage folks to look at the code and modify it, they don’t just let anyone add anything back to the original project. Projects usually have one or several people with direct commit access, who don’t need permission to do commits. This doesn’t mean you can’t contribute to the project; you’ll just need to get your own copy of the code, make changes there, and then send them back to the original project for review. Contributing to an open source project can be a lot of fun, and Github makes that process pretty easy. Still, there are a few steps to keep in mind to make sure your workflow is sound and your contributions have better chances of getting accepted. To follow along, you’ll need an account on Github, and you’ll need to have git installed on your machine. This post won’t go into detail about using git, but if you’re not familiar with it, check out Eric’s post on Teaching Git and the git resources we’ve collected for the Praxis Program. 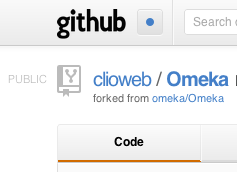 Dashboard for my fork of Omeka, indicating that it has been forked from omeka/Omeka. The dashboard for you fork will indicate that it was forked from somewhere. Github’s own help pages include a nice run-down on how to fork a repo, but to summarize: To fork any project on Github, you’ll can just click that big “Fork” button near the top right of the project’s Github page. Github will then ask you where you want to fork it, you choose which answer, and Github will do the rest. It shouldn’t take too long to fork, but that depends on the size of the original repo. Now you can make changes and do commits however you like, without any fear of breaking the original repo! As I’ll explain later, though, we won’t just make commits however we like with our forked project. We’ll want to follow some conventions to make our work more productive to send patches back to the original project. This creates a remote named upstream to our remotes list, and points to the origina Omeka repository. You could name this something other than “upstream” if you prefer. After adding this upstream remote, you should have not one, but two remotes. When you clone your fork, that creates the first remote, origin, that points to your fork on Github and that you can push back to. The second one, upstream, points to the original repo you forked. This is a pretty good thing to keep in mind. When you clone a repo, you’re making a copy locally, but it also make sure there’s a way to send stuff back to the repo you cloned. The latter is just a shortcut for the former. Now that you have your local master branch updated with changes from the original repo, we can start working our own commits! In git, “branches are cheap and easy.” So the best thing to do when adding a new feature or fixing a bug in a git repo is to do that work on a separate “topic” branch. That is, a branch whose changes encompass, roughly, a single idea or topic: adds a single feature, or fixes a specific bug. This allows you to work on different features/bugs simultaneously and separately. You can keep updating a specific feature after you’ve submitted a pull request for it, which is handy if in the course of discussing the pull request other developers suggest changes to it. While you can add multiple features to a single topic branch, you might run into a situation where you don’t like that feature anymore or, more commonly, the developers on the original repo only want one of the features and not both. Similarly for bug fixes. The granularity of this depends, of course, on the nature of the feature or bug you’re addressing. Once you make your topic branch, you can now start editing code. Any commits you make will only be on this branch, too, so you can always check out the master branch while working on a feature to do some other work if you want. The -u flag will create a new branch to your fork on Github called ‘my-topic-branch’. After you do this, you continue to make changes on that branch, you can push them up to your Github fork without the -u flag. Developers on the original repository can comment on the request, see the code attached to it, and approve or reject the request. 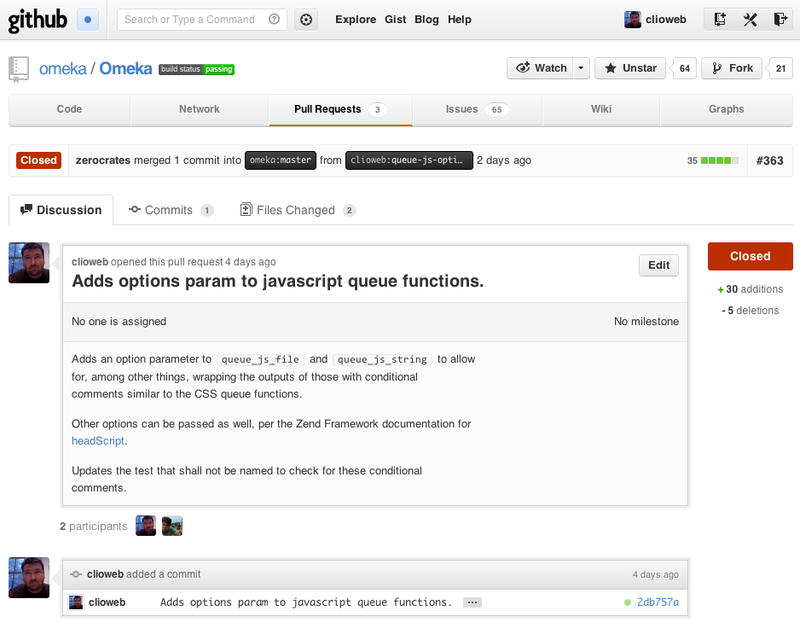 (Check out the current pull requests on Omeka to see this in action.) If they do request changes, you can just update your topic branch locally, make your commits, and push them back up (this time, omitting the -u flag, since that topic branch now exists on Github.) In the meantime, you can go back to your local copy, create a new topic branch, and work on something else! Pull from the upstream remote to merge updates. Create a topic branch for your feature or bug fix. Make your commits, with good commit messages. Send a pull request back to the original repo. 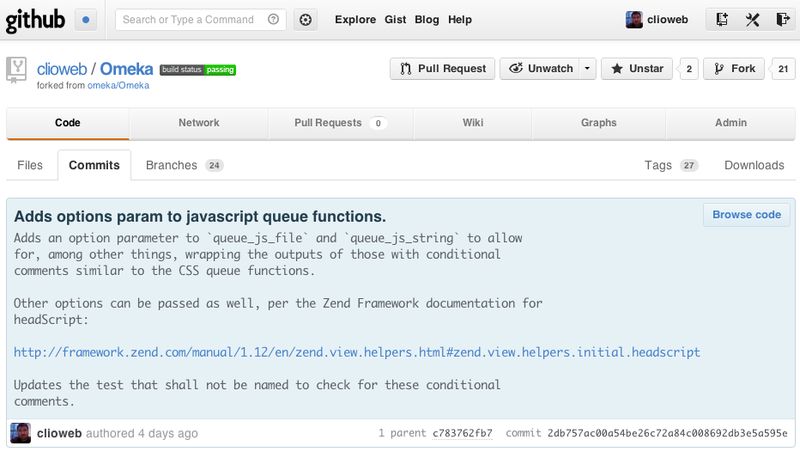 Converse with developers, make updates to your topic branch if necessary, and keep pushing back to your fork. Repeat for a new feature or bug fix. Cite this post: Jeremy Boggs. “Forking, Fetching, Pushing, Pulling”. Published November 07, 2012. https://scholarslab.lib.virginia.edu/blog/forking-fetching-pushing-pulling/. Accessed on .